Apple maggots can ruin an entire crop, leaving you at a loss as to what to do. Learning how to recognize the signs and taking the appropriate preventative measures beforehand is essential in fighting off these pests. The most susceptible apple varieties are the early maturing types as well as those with thin skins. While other worms affecting apples may be confused with these pests, you can normally tell them apart simply by taking a closer look. Caterpillar worms, which are generally larger, will usually feed deeper—to the core itself. Apple maggots, which are the small (about ¼ inch) larva of fruit flies and resemble maggots, typically feed on the flesh, tunneling throughout the fruit. Evidence of apple maggots can be seen as tiny pin pricks, or dimples, in the skin. In addition, affected apples will begin to decay rather quickly, becoming soft and rotten prior to falling from the tree. As the maggots grow and tunnel, you will find the tell-tale brown trails winding throughout the fruit when cut open. The best way to prevent attacks is by keeping everything cleaned up by picking apples regularly, especially those that fall from the tree. Unfortunately, once affected, the only treatment is through chemical control, which is normally targeted towards the adult fruit flies. 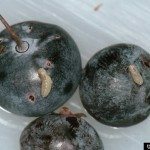 The specific types and availability of products for apple maggot control can usually be obtained through your local county extension office. Affected trees are sprayed from around mid July to pre-harvest with continual applications (per product instructions or mixed using 3 cups kaolin clay to every 1 gallon of water) every seven to 10 days. Another apple maggot control product, which is more natural, is kaolin clay. This is often used as a preventative measure, as it creates a film on the fruit that insect pests find irritating. As a result, they tend to avoid any trees/plants that have been treated with kaolin clay. Spraying should be done in mid to late June and reapplied every seven to 10 days. Be sure to fully saturate the tree. Apple maggot fly traps are also available for preventing these pests. These can be purchased from most garden centers or through agricultural suppliers. 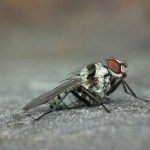 Apple maggot fly traps are usually set in spring (June) and monitored throughout fall (September). Place one trap in trees less than 8 feet tall and about two to four traps in larger trees. Traps should be cleaned weekly and may require replacement monthly. Another idea on how to trap the apple maggot is through the use of homemade methods. For instance, you can take some red balls (Styrofoam works well)—about the size of an apple—and coat them with a sticky material, such as molasses. Hang these fake apples on the tree (about four to six per tree, depending on size) at shoulder height. This should attract the fruit flies, which will stick to the balls and promptly be discarded once full. You can also mix 1 part molasses to 9 parts water with a small amount of yeast. Pour this into several wide-mouthed jars and allow them to become fermented (ready once bubbling subsides). Hang the jars on the strongest limbs and the fruit flies will become trapped inside.